Back in the 15th Century, San Vicente Ferrer warned the Mallorcans that the island was hollow inside, that it was like a pottery bowl turned upside down. 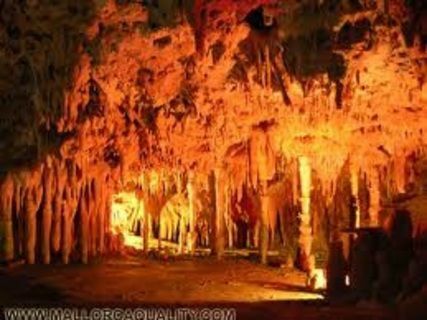 Although the comparison sounds exaggerated, it is true to say that in Mallorca alone there are more than two hundred known caves. The Cuevas dels Hams are a beautiful example of these mysterious settings formed drop by drop over thousands of years. The Cuevas dels Hams are found in Porto Cristo, a coastal town in the municipal district of Manacor. They were discovered by Pere Caldentey on the 2nd March 1905, although they were not opened to the public until five years later. Their discovery was due to a coincidental factor. In 1890, this Mallorcan speleologist had travelled to Chile, where he saw various objects sculpted in onyx similar to the stones which he knew existed in his Manacor homeland. On his return to the island, he began his work and a short time later he found some quarries of high quality onyx. Just two hundred metres from here were the caves. Curiously, the mausoleum erected to Cardinal Merry de Val in the Basilica of San Pedro in Rome was built with stone from these quarries. Concert in the Sea of Venice A tour around this large cave takes the visitor into fourteen different rooms. The entrance receives the name of Primeras Visiones (First Visions) and the next room is called Cementerio de las Hadas (the Fairy Cemetery), with stalactites which look like cypresses around a statue. The deepest place lies some thirty metres down. This is the lake known as the Mar de Venecia (Sea of Venice), the setting for a concert with musicians playing in a boat which is lit up and with impressive sound effects. Living in the lake are some small prehistoric crustaceans which are white and completely blind. Another of the most spectacular rooms is the one which Caldentey called El Paraíso Perdido de Milton (Milton's Lost Paradise). 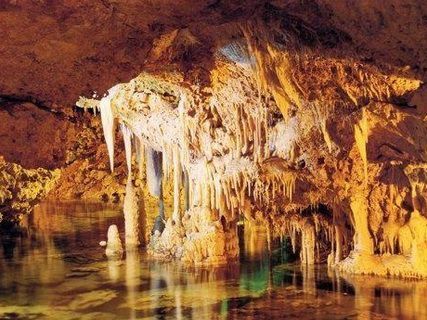 Also striking is El Sueño del Ángel (Dream of an Angel), where the stalactites are hook-shaped which is what gives the caves their name, since 'hams' means 'hook' in Mallorcan. The room is situated some twenty metres deep and, apparently these shapes are produced by the currents which exist in this part of the cave. The spiders, in their laborious eagerness to weave webs, also contribute to this process. 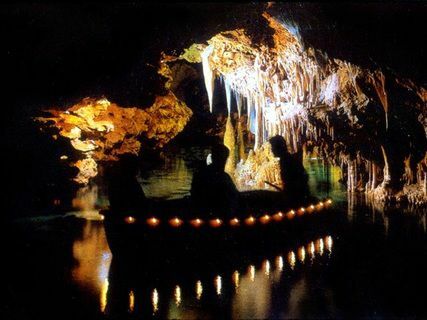 The beauty of the stalactites and stalagmites is heightened thanks to the light effects which are colourist at times and natural at other times, giving rise to magical scenes. i went today and i do not understand the comments !! no videos at all !! There are not many people so you can enjoy the visit unlike the drach caves. It is smaller than the drach caves. but they are not comparable. There is better light in hams unlike drach caves which they put very bad lights so tourists do not spend too long with pics as it is overcrowded. the best of hams caves is how the play with lights. amazong effects with lights. As i said they are different so they are not comparable but they can be complementary. for me it was worth it. i can say that the best pictures of caves are from this caves althought i recognize that the drach cave is more espectacular because it is much bigger !! Easily confused with Caves of Drach as huge signs on approach and mix up with Google caused us to visit here instead. Not a bad visit, but random video of Jules Verne seemed a thin connection. Wasn't so much to see. Don't go there. They put you a movie with Jules Verne that have nothing in common with the cave!!! And one more movie that I don't understand nothing! Don't go there!! Those are not the popular caves of Porto Cristo. It has many adverts, colorful 3€ discounts to grab unaware tourists. Good thing of this is that there is almost no one there so it is not very busy. It costs about 23€ which even with discount is more than Drach Caves.